Updated 12/16/16 - I have a few casts of most everything else left except Cool Breeze heads. However, most of them have moderate defects other than the Big Kev vest. If someone wants some and pays shipping, I can ship them. The recipient can pay, after receipt and review, whatever they feel they are worth. 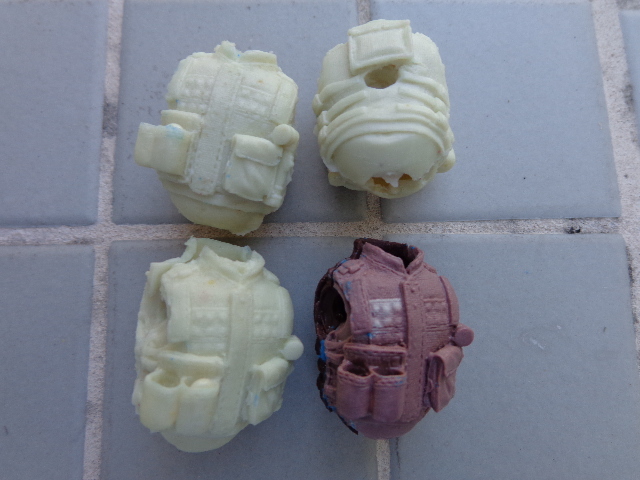 Or, if there is sufficient demand for any of these parts, I can make new molds. Someone, or a group of someones, would need to buy at least 5 of each item. Updated 9/5/16 - Added Big Kev vest. EVERY dollar from selling these P:ARAH pieces goes toward the next head sculpt commission here on OWN. First up, if you paid for these parts from VeteranofthePlasticWars and didn't receive them, please check with Cyko as he received a small number of parts from Veteran and may be able to get you some of what you paid for. My understanding is that these parts were commissioned and paid for by the Project:ARAH group, and as such the parts belong to members of P:ARAH. My goal is to get some of these parts to former P:ARAH members. I am not looking to step on any toes. I am only looking to cover my costs. Any profit received over cost will be put toward a future OWN commission. If there are parts left over after OWN members have picked up what they need, I will likely offer these parts on joecustoms to other former P:ARAH members at the same price. If there are any leftovers beyond that, I'll offer to the Joe community at large at a higher price, again with any net profit going to a new OWN commission. Price: $5 for a torso and head pair. $2.50 for just a head. $4 for shipping in the US for any or all. Pictured is everything available. All torso molds have ripped except for Big Kev. I can, however, still cast more heads as those molds are still going strong. If demand outstrips supply, I will create a wait list, and MAY recreate torso molds in the future. No promises. I'm kinda sick of casting, especially torsos, at the moment. How do I pay and what's your email for paypal ? What's your email for paypal? Pretty psyched. I just used a dremel to take out the extra resin that found its way into Cool Breeze's back hole. Then, I used a vise hand drill and drilled out a screw hole. Result: the torso halves screw together using a standard Joe screw! Forcefull could you please fix my torsos? Can we get some clearer pics? I need to see what is what before making an order. forcefull1 wrote: My understanding is that these parts were commissioned and paid for by the Project:ARAH group, and as such the parts belong to members of P:ARAH. My goal is to get some of these parts to former P:ARAH members. I am not looking to step on any toes. So if I was one of the people that paid Slayer Dave $100 for Pythona and a Big Lob head and who knows what else, that gets me what exactly? I am only looking to cover my costs. $5 for a torso and head pair. $2.50 for just a head. $4 for shipping in the US for any or all. I was lucky enough to get these when Cyko lent his pieces to VeteranofthePlasticWars for recasting. 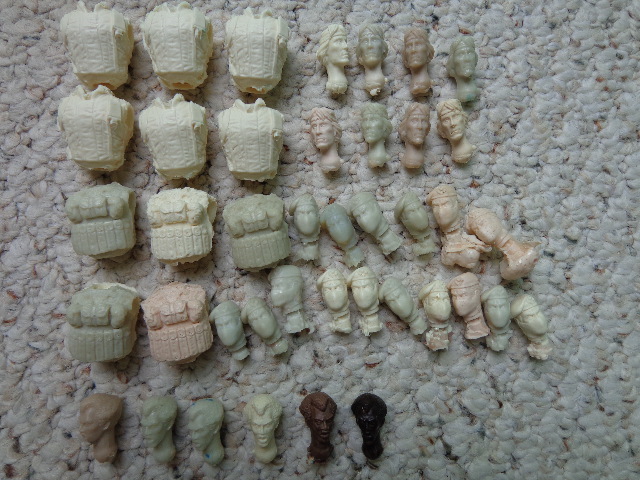 I did some limited molds and thought I would help out anyone else here that wanted the available pieces. I have zero affiliation with Slayer Dave. I'm with forcefull1. He has been kind enough to make some parts for us. In flesh tone if possible! I'm located in Canada for shipping. FYI, just discovered all the notifications where going to my spam folder. For the record, I've recouped my materials costs. 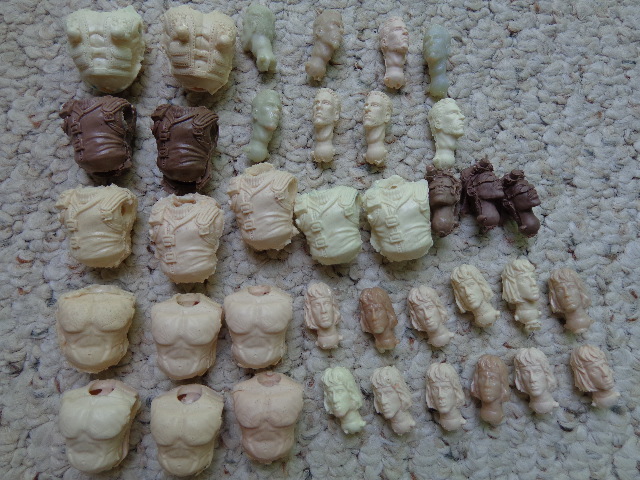 Every sold P:ARAH cast from here on out will be money toward a new sculpt. Forcefull1 would you like to take the lead and start a new poll? Bump for availability of Big Kev vest. The Big Kev vest is available. I have a few casts of most everything else left except Cool Breeze heads. However, most of them have moderate defects. If someone wants some and pays shipping, I can ship them. The recipient can pay, after receipt and review, whatever they feel they are worth.